If you want to book a stay in Bainbridge Scott’s Airbnb in Los Angeles’s Montecito Heights neighborhood, you’d better plan well in advance. Listed as a “Rustic Studio with Private Garden Patio,” the hillside property boasts a terrace with views of the city, a classic clawfoot tub, and an extensive garden from which guests can pluck pomegranates, grapes, and avocados. It looks like nothing so much as a slice of Tuscany — but is just north of downtown L.A. and available for the unreal price of $92 per night. With the exception of single nights here and there, it’s booked through Halloween. According to a report released Wednesday by Airbnb, Scott is one of 45,000 teachers who list short-term rental properties on the site, earning an estimated collective $160 million in 2017. Using internal booking data to estimate the number of nights each likely rents out a property, the company estimates the typical “teacher-host” brings in $6,500 a year. The average LAUSD teacher earned $75,350 in 2017 — among the highest salaries in the country, but hardly a fortune in pricey California. Using internal data, Airbnb released its report to try to counter concerns in cities throughout the country that the rise of short-term rentals is negatively affecting everything from affordable rents to gentrification. A proposal in L.A., for example, would cap short-term rentals at 120 nights per year, unless a host can demonstrate a good track record. Renters complain of having their housing when their landlord converted a dwelling to short-term rentals; homeowners say they would not be able to pay their mortgage without the income generated by an online listing. 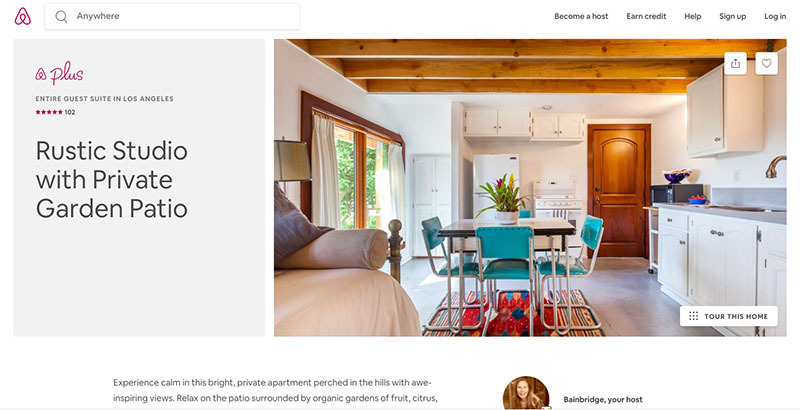 Public relations value aside, the report provides a rare glimpse into Airbnb’s workings. In Wisconsin and Utah, for example, 26 percent and 25 percent, respectively, of Airbnb hosts list their occupation as teaching or education. Some 75,000 property owners have a teacher in the household, Airbnb reports. Overall, 1 in 10 Airbnb listers is a teacher, according to the report. The company did not disclose totals for Los Angeles, but in San Diego, 15 percent of listings are owned by teachers, who earned an estimated $2.7 million in 2017. San Francisco teachers earned an estimated $4.1 million during the same time period, with average bookings of 79 nights a year. In New York City, where the debate over short-term rentals is particularly fierce, 11 percent of Airbnb listings belong to teachers, who typically rent them out 56 nights a year for an estimated $11.7 million. Other cities the company identified as having higher-than-average numbers of listings belonging to teachers include Philadelphia; Pittsburgh; Asheville, North Carolina; Orlando; Tucson; San Antonio; Seattle; and Austin, Texas.